Ryan Thomas Gosling was born in London, Ontario, Canada. He got his start in acting on The Mickey Mouse Club after he beat out 17,000 other actors to get a spot on the show. He starred with Christina Aguilera, Britney Spears, and Justin Timberlake. After roles in several films, He received the most recognition in 2004 for his role in The Notebook (2004). Shortly after, Gosling received an academy award nomination in Half Nelson (2006). 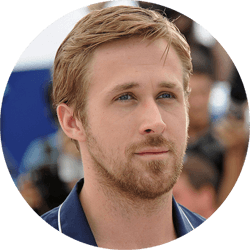 Gosling recently directed his first film, Lost River (2014).